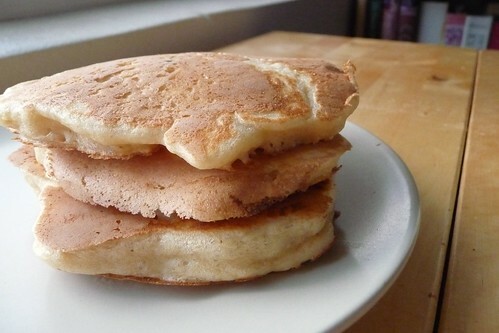 One of the things my husband has been missing from his home country is eating rauga pankūkas or yeast pancakes. I’m not really sure why it took us this long to get around to making them but after we replaced the dead yeast (always check your expiration dates!) he decided he really wanted to make a batch for our Sunday breakfast. Now I’ve said before that if breakfast were up to me, we’d subsist on bagels because they’re easy to pop in the toaster and load up with cream cheese. When I was single, that was basically breakfast every day — on the days I managed to eat breakfast at all! My husband just shook his head at me and, ever since we met, has always made breakfast for the two of us. Sundays, however, are special. Since we allow ourselves an extra hour of sleep and Sundays are usually slow-moving days, he likes to make something that maybe takes a bit more work or is a bit more special than an ordinary day. One Sunday might involve crepes with my homemade freezer jam, another might be a Dutch baby or popovers, maybe even fresh-baked muffins. 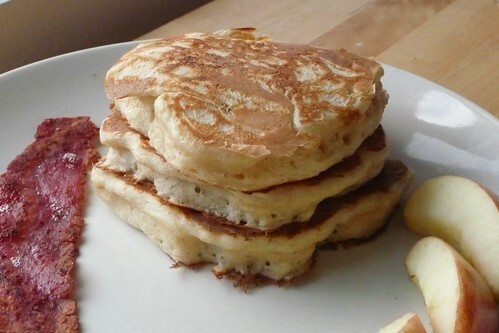 And last Sunday, he opted to finally make yeast pancakes. Beat the egg yolk together well with sugar and salt. Warm the milk to between 120F and 130F, then stir slowly into the beaten egg2. Sift the flour and yeast together in a shallow dish, then slowly add the wet ingredients to the dry. Mix just until a soft batter comes together. Sprinkle the top with a bit of flour and set to rise in a warm place for 1 1/2 to 2 hours. If you’re making this the night before, cover the batter with plastic wrap and place it in the fridge overnight, then proceed with the remaining steps in the morning3. Beat the egg white until it becomes white and fluffy, soft peaks optional. Fold into the batter in thirds, being careful not to overmix. If the batter is too stiff, add a bit of water or milk to loosen it up enough to be scoopable. Wet a spoon4 before portioning each pancake so the batter doesn’t stick and fry as with ordinary pancakes in a non-stick griddle or pan set over low to medium-low heat in a bit of butter or oil until golden brown and delicious. We used a mixture of 120 g all purpose flour and 80 g whole wheat pastry flour in one of our sets. The pastry flour gives that whole wheat taste without adding too much gluten. Tempering isn’t necessary here as the milk is below the temperature at which eggs curdle (between 160F and 170F), but you can do it if it makes you feel better. If you want to make these just before breakfast, the easiest is to prepare the batter through the rise the night before. Then all you have to do is beat some egg whites. Otherwise, you’ll be up at 7a to have a 10a brunch on the breakfast table. Wetting the spoon in between pancake batter portions is important. This stuff sticks. This entry was posted in breakfast, latvian, recipes, untranslated. Bookmark the permalink. I am very excited about this site , why ? because I am Latvian married with british and living in England and every time if there is something about Latvia makes me excited .. before I moved to the uk I never cooked in my life and only here I learned how to : ) also I had to because where else I would find Solanka , potato pancakes ,rasols etc in UK : ) About Kefirs I have different story – my husband don’t like it but my 3 year old daughter LOVE it , first 2 years I couldn’t find it here but when I finally found it – cold soup was made : ) ( auksta zupa) with beet root ..also last Christmas first time I baked Piparkukas from my granny’s recipe .. I am so glad that you as a american are interested in Latvian culture and cuisine , because is true that nobody really knows where is Latvia ..thanks for this amazing site and I will be here again .. Thank you, I’m glad you’re enjoying my blog! I admit, like many Americans, I didn’t really know much at all about Latvia before I met my husband, but I’m awfully glad to have learned. There’s a lot to love about Latvia and her food, culture and traditions, like grey peas, for example, which I am hoping to get another kilo of through Customs before Christmas. Mm. Auksta zupa, I should make that while I can still get great beets locally. It sounds like you’re on a roll! Here’s to many more Latvian cooking adventures :) Cheers!